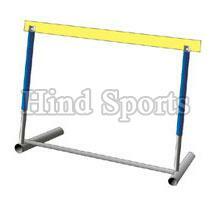 We are the prominent Manufacturer, Exporter and Supplier of Athletic Hurdles. Our Athletic Hurdles are high on demand in the national as well as in international market. Athletic Hurdles suit the ability of the athletes. Athletic Hurdles are safe for the athletes even if they fall while jumping. Our Athletic Hurdles are specifically designed for beginner/practice hurdles as well for professional athletes.